Tales from the Perilous Realm is as much a children’s book as it is a great look at the backstory of many of Tolkien’s better known creations. While so much of Tolkien’s fame comes from the Hobbit and Lord of the Rings, his mastery of fantasy has other outlets as well. Tales from the Perilous Realm includes a scholarly introduction, and a very long article by Tolkien about writing about fairies and fantasy. I’ve reviewed most of the stories that are in this collection in entries of their own, and in the follow list, I add links to those reviews. The additional stories in this one were Leaf by Niggle, which is an interesting parable about the journey to death, and in some ways may be too sophisticated for children, and The Adventures of Tom Bombadil, which I found a little hard to read, but could make a fun read aloud to younger children. Finally, Tolkien’s essay on Fairy-stories is for adults. 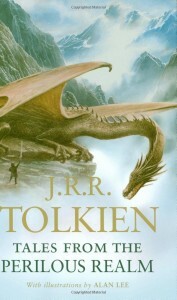 Overall, for Tolkien fans, and for any one who likes good literature, this collection is well-worth adding to your library, whether it is a school library or a home library.